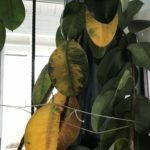 How do I help a rubber tree? I have a rubber tree it is about 4' tall and only maintains two leafs at a time. What can I do to help restore it to splendor? if it suffered a frost or freeze, it is possible that the root system is damaged. in case it's not, try clipping it back to right above the first leaf. sometimes, that's enough to force new growth. once you do that, water it well, then do not water again until the soil is very dry. i water mine about every month and a half or so. i've had it for 6yrs and it does well this way. in the summer months, i take it outside and let it soak up some of the heat. they are tropical plants, so they appreciate the heat and even some humidity. also, consider moving it into a spot that gets indirect sun. try this and hopefully you are set up for success! if all else fails, compost it and start over. $15-$20 at a local nursery should get you back in business! My rubber tree is in a medium size pot. It gets full sun on every sunny day I even tried a sun light through the winter months. The person I got it from said it got froze once. I even tried giving it fresh soil. Thank you for any suggestions. is it getting enough water and sun? what size container do you have it in?